* Never Too Busy fragrances have become cult favorites. When the company closed in 2009, they started getting rerelease at Lush through their Gorilla line. Cocktail is one of these. * Cocktail kicks off with a powerful blast of lavender and yiang yiang. The duality of traditionally male and female notes are quite interesting. * The projection is quite powerful at the beginning – people around you will definitely notice something. * As the top calms down, orange blossom joins with some soft, powdery florals. 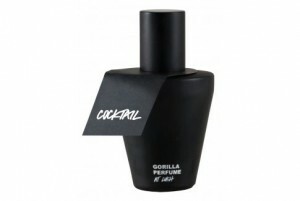 * For a scent called cocktail, it’s odd that there is no liquor or booze smell anywhere. * Have you ever tasted the Violet candies by C Howard? Thats what I smell in the soft base, along with some light sandalwood. Summary: Lush fragrances use a lot of natural ingredients, so I’ve found that each time I wear Cocktail its a little bit different. Sometimes the yiang yiang on the top lasts all the way until the end, while other times I get a lipstick smell in the mix. Lush scents are available in smaller size at very reasonable prices, so if you are looking for something quirky to experiment with, try a cocktail. Cocktail is available at Lush Stores and from the Lush Website.